Better than I expected. And you can get internet phone and TV on that service for about $30 a month. Last edited by Syph; 02-22-2009 at 11:57 PM. 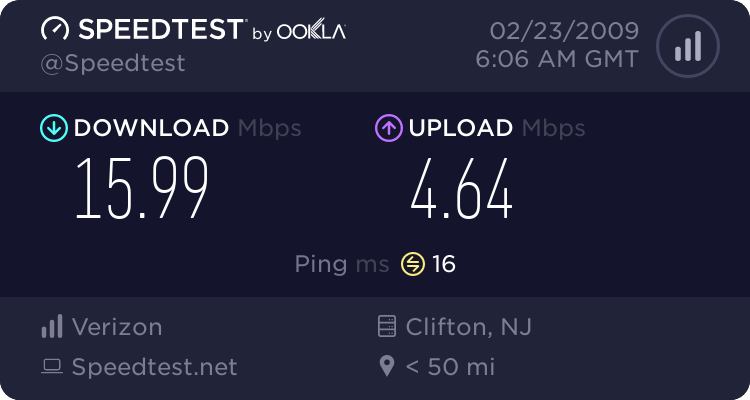 It's better than what you get since cable's not a dedicated connection. 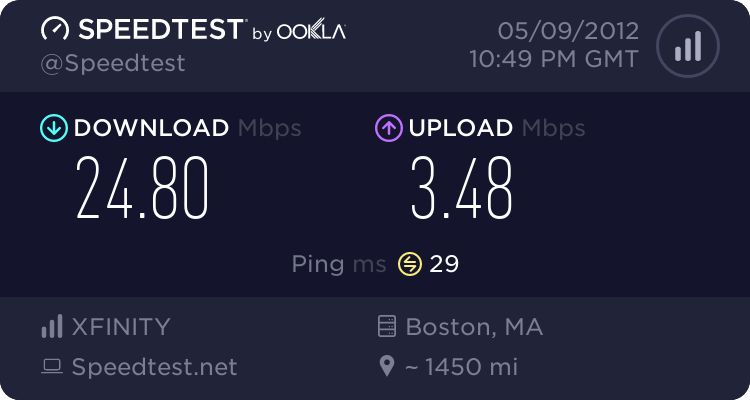 My home FIOS connection, which is reporting incorrectly since I've done speedtest before at it should be ~20000kbps/~5000kbps. After all I download from Steam at 2.5MBps. The ping is abnormally high. Hmm. 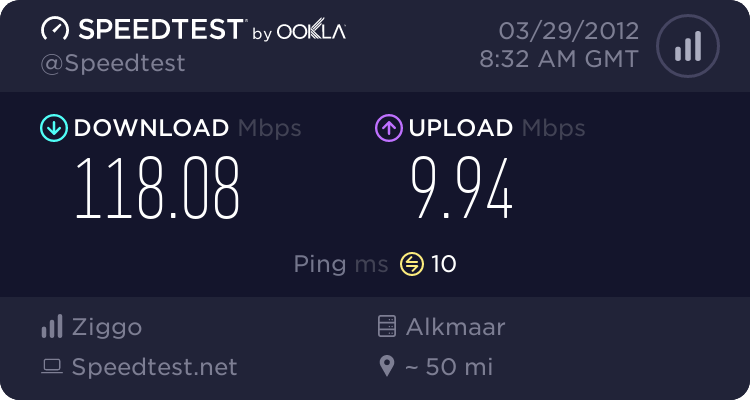 I performed my internet speed test here IP-Details.com . Can't complain, haven't had any connection hiccups in ages either. 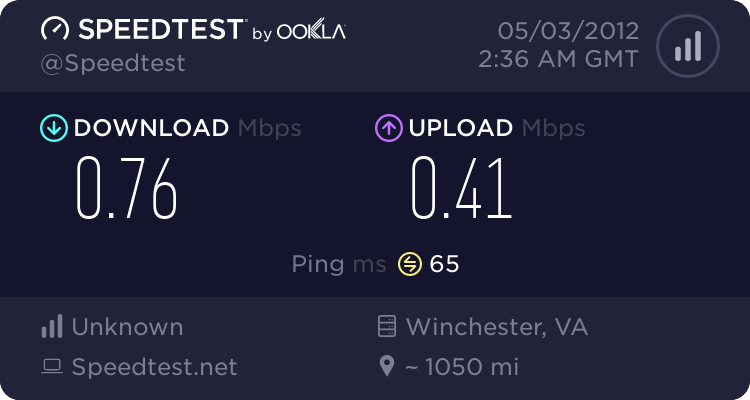 I have a 6Meg DSL connection, but I am a long way (15,000ft+) from the switch. 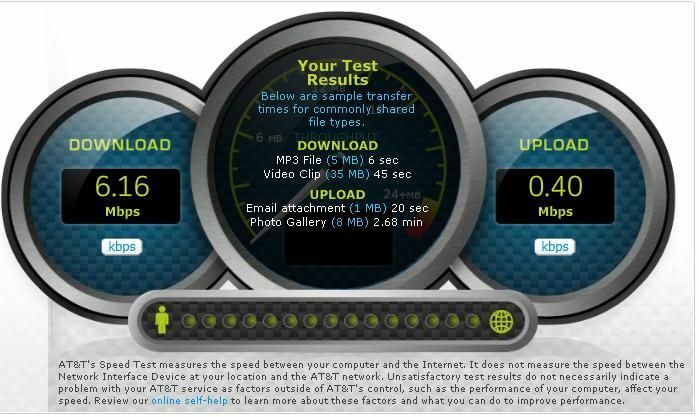 But this is my test from AT&T (provider). The results are always the same... Much higher. So this is the real problem... when I have an "actual" problem with my connection, AT&T will not do anything until it TESTS below 3.5Mb/s. But they will only reference their own test. Here is the problem I have had happen three times now. 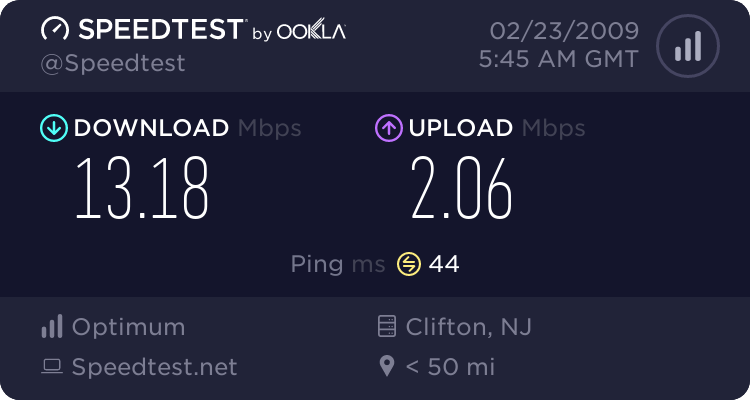 By the time the AT&T test shows below 3.5, the connection is not even usable, not exaggeration. The degradation is not proportional. 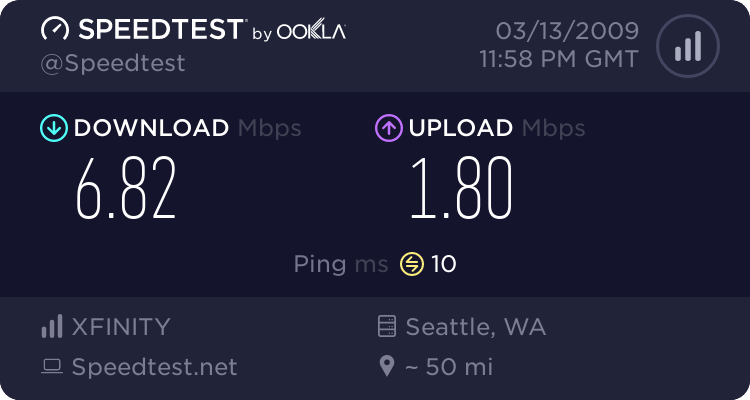 When the AT&T test shows 3.0 or below, SpeedTest.net, no matter the server, will show a time of about 0.5Mb/s. 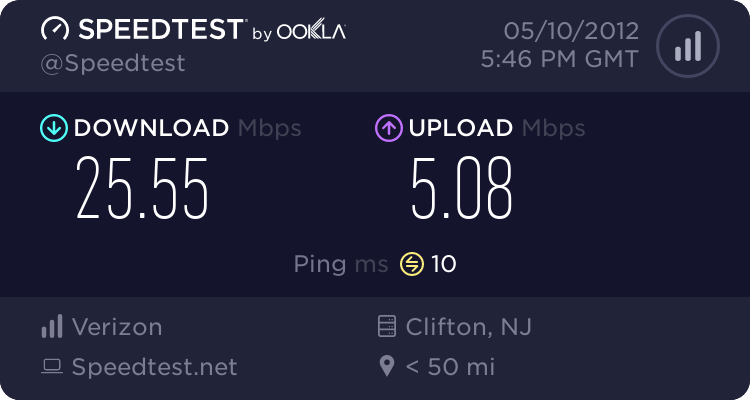 So when it finally got low enough for AT&T to listen (below 3.5 on their own test) I called... after jumping through all their hoops of testing, they said it was "ok" and there was nothing else they could do. I had to agree to pay to have my line tested. The first test guy worked on it for some time and said there was a serious problem that was over his head. The second guy was AWESOME and spent hours going back over the lines to get every copper connection back the the switch as perfect as possible, just to have a better position to argue with his own network tech support. Meanwhile here was what I did... I used my own switch (like an old programable switch enterprise HP Procurve 4000) some routers and ran a routine to stall the router at my own intervals... 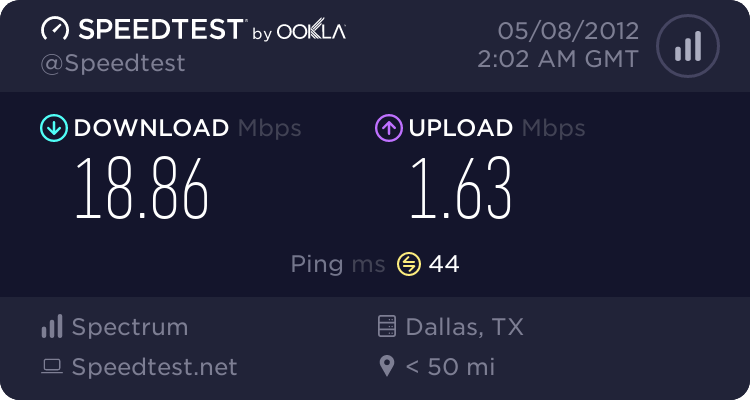 I tried several different timings, but in the end, what I discovered was HOW the AT&T test works... if the data stops, so does the timer, up to like 2000ms! What does this mean? Metaphor... lets say you were going to time a runner on a track... you click your stopwatch... as long as they are moving, you keep timing, but if they come to a complete stop, you pause the stopwatch. Holy crap... what a test. You know WHY their test works so well? Well now I did, and it was WAY bad because the end result last time was that THEIR switch had 30%+ Packet loss... the AT&T test would basically "stop counting" when the packets didn't arrive. So everyone in the neighborhood (so to speak) was having the same problem but didn't have the knowledge to argue it... this had been happening for a MONTH! I posted everything above and a lot more, without insult, just the facts on the AT&T support website... I didn't explain exactly how I tested the AT&T speed-test, but I explained how it could be done. So how did AT&T solve the "real" problem in the end? I am perma-banned from AT&T Support Site now. Here is my connection now... the cycle of failure is starting again... and there is nothing I can do about it. Last edited by MrBlackCat; 05-02-2012 at 08:40 PM. Faster internet than the Siegler. My life is complete. Wish I had more upload speed. I'll definitely be upgrading my internet package in the future. Seems my chosen package is living up to it's name. 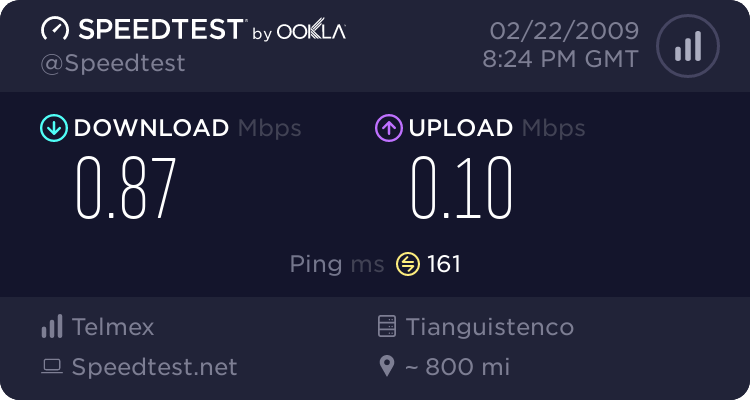 They set the Surfboard cable modem to a very consistant mediocre speed. 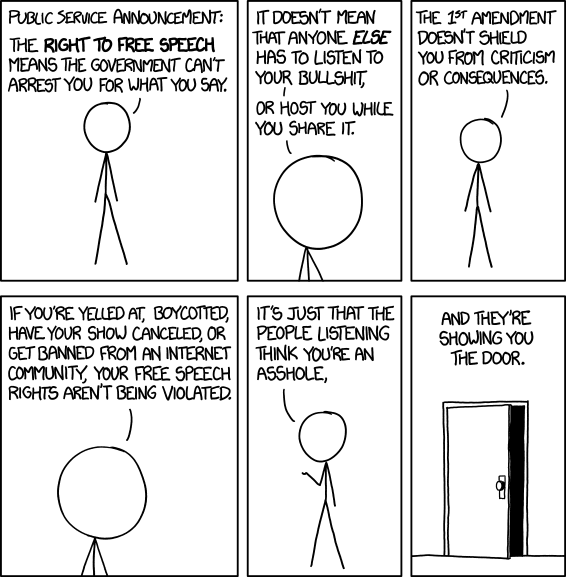 I pay $40 a month. It's a TimeWarner owned and managed line. Hehe, I can see that Cox isn't that much better. You get a better speed then i do. My upload speed isn't great... but that's not an issue as I don't upload that much (if anything). 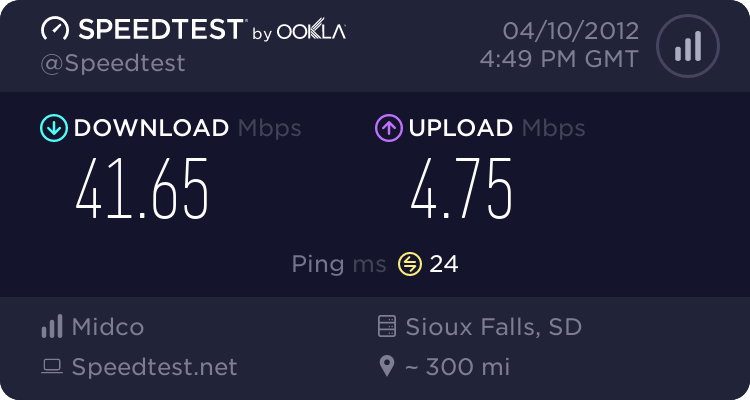 Just got fiber this week. Loving the new speeds! Yes, this is at home. 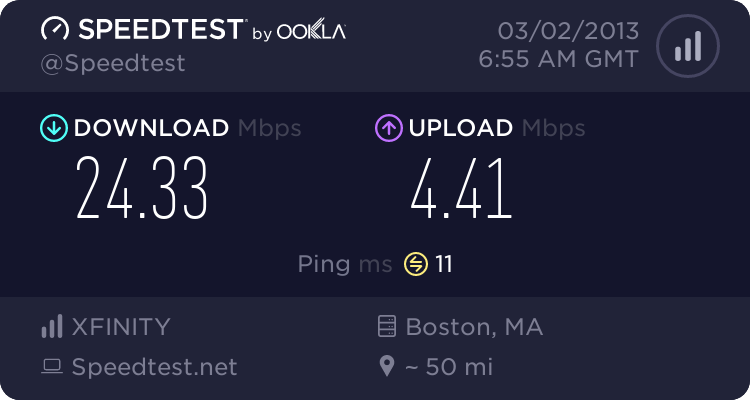 I am curious, what kind of download speeds do you see usually? I was getting speeds of about 2Mbps down, .65Mbps up and a ping time of 508ms. 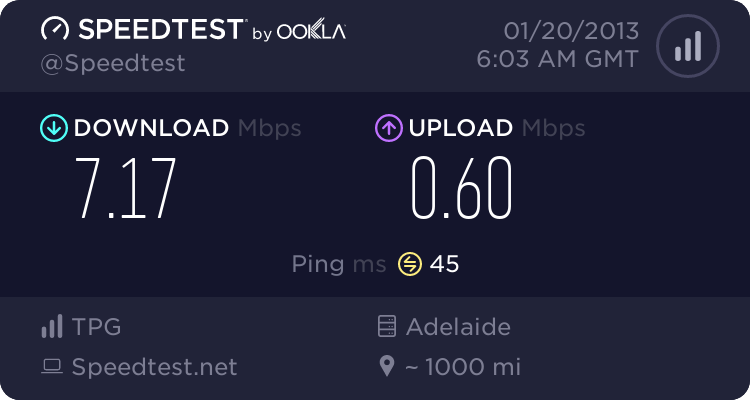 I discovered my ISP has internet profiles and it was set to a ADSL Very High reliability profile which is the slowest profile they have. It is still quite slow compared to some internet connections here but it's the only connection i've got in my area.